This is the basic information you need to know before a trip to Morocco. Currency: The unit of currency is the Moroccan Dirham (MAD), which is divided into 100 centimes. It's a restricted currency, so can only be bought inside the country. ATMs are now widely available in the larger towns and are the best and easiest way to get funds. Do not bring travellers cheques or Australian dollars. Euro and USD notes can be exchanged at banks or official bureaux de changes, which are also widespread in major towns. Dirhams cannot be obtained or exchanged outside Morocco and receipts must be retained as proof of legal currency exchange, as well as in order to re-exchange money when departing. Major credit cards are accepted in the larger shops, hotels and restaurants, but not AMEX. Language: Modern Standard Arabic is the official language and all TV and newspapers are in Arabic. However, Moroccan Arabic is the spoken language. Tachelhit, Tamazight and Tarifit are all derivations of the Berber language. Tachelhit is spoken in south-west Morocco, in an area between Sidi Ifni in the south, Agadir in the north and Marrakech and the Draa/Sous valleys in the east. Tamazight is spoken in the Middle Atlas, between Taza, Khemisset, Azilal and Errachidia. Tarifit (or Rifia) is spoken in the Rifarea of northern Morocco. French and Spanish are also spoken. English is growing in importance and generally understood in the tourist areas, but French is the more common. Visas : For New Zealanders, Australians, Canadians, EU passport holders and US citizens, no visa is necessary for a stay of up to three months. For South Africans, a (free) visa is necessary from the Moroccan Embassy in Pretoria. Health: Health insurance should be taken out before you leave your home country. No vaccinations are required to enter Morocco. It is advisable to drink bottled water and be selective in the case of street food. Bottled drinking water is available everywhere and is inexpensive, although some restaurants charge an exorbitant markup. From any street-side shop, a 1.5-liter bottle of water will cost no more than 10dh. Often street food is safer than some tourist restaurants. Medical facilities are good in all major towns. Tipping: A tip of 10 % is welcome but some places include a service charge. Giving a few dirhams to the poor is a good thing to do, but never give money to children unless they've provided a service, like showing you the way to your guesthouse, when Dh5 is sufficient. Safety: Violent crime is not a major problem, but there have been thefts at knifepoint in major cities and especially on beaches. Do not wear flashy necklaces as these are an easy target. Be sensible in dark streets at night. Walk with a friend. Use official (badged) guides only. Traditions and customs: Morocco is a Muslim country and it is preferable to keep the wearing of swimsuits, shorts and other revealing clothing to the beach or hotel poolside. Women travelling alone will receive less hassle if dressed conservatively. Smoking is practised widely, and it is customary to offer cigarettes in social situations. Religious customs should be respected, particularly during the month of Ramadan when eating, drinking and smoking during daylight hours should be discreet as it is forbidden by the Muslim culture. The giving and receiving of things, and the eating of food, should only be done with the right hand, as the left is considered unclean. Homosexuality is a criminal offence, and sexual relations outside marriage are also punishable by law. Alcohol - Morocco has a well established wine industry as well as good beer production (Casablanca, Flag Special) Many Moroccans drink, but very few in places other than restaurants or bars. . The legal drinking age for Moroccans is 18, however many places will serve most people. Avoid Moroccan bars, frequented by Moroccan men and prostitutes. Most top-end restaurants and many riads serve alcohol, as will nightclubs in the resorts of Agadir and Marrakech. To purchase alcohol visit the national supermarket chains Acima and Marjane and Carrefour. Note that the alcohol departments shut prior to and during religious holidays such as Ramadan and Eid. Do not drink alcohol in a public place. Ramadan - the dates move back 11 days each year. Check for exact dates if arriving during Ramadan. Try to avoid drinking, eating and smoking in public during the hours of fasting. Business: Business in Morocco is based on French customs and is much more formal than in some Western countries. Always check in what language a meeting will be held. Arrange your own translator well in advance. Government departments work from Monday to Thursday 8:30am to noon and 2 to 6:30pm, and Fridays 8:30 to 11:30am and 3 to 6:30pm. Communications: Internet Cafes are everywhere but the keyboards are often French (non-qwerty!). Almost every riad and hotel now has free wifi. Connection speeds vary between average and good. Phones - The international access code for Morocco is +212. The outgoing code is 00 followed by the relevant country code (e.g. 0044 for the United Kingdom). City/area codes are in use, e.g. Hotels can add a hefty surcharge to their telephone bills; it is best to check before making long international calls. Three mobile networks cover the the country and cheap phones ans SIM cards are inexpensive. Duty free: Travellers to Morocco over 18 years do not have to pay duty on 200 cigarettes or 50 cigars or 400g tobacco; 1 litre spirits and 1 litre wine; and perfume up to 5g. 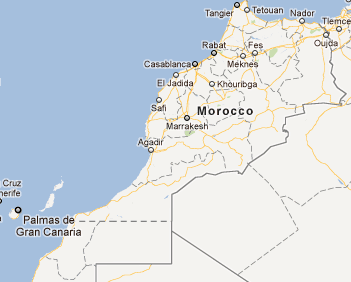 In-country travel: Note that distances are deceptively far in Morocco, so don't try to see too much in too short a time. CTM is the best bus company, though the website is not helpful. Train travel is easy and inexpensive. See www.oncf.ma for train schedules, though you can't book online. If possible, book a day or two in advance and try to travel first class for comfort's sake. American Embassy, Rabat: +212 37 76 2265. Australian representation in Rabat (Canadian embassy): +212 37 687 400. British Embassy, Rabat: +212 37 63 3333. Canadian Embassy, Rabat (also responsible for Australia): +212 37 687 400. Honorary Consul of Ireland, Casablanca: +212 522 27 27 21. South African Embassy, Rabat: +212 37 706 760. New Zealand Embassy, Madrid, Spain (also responsible for Morocco): +34 915 230 226. Moroccan Embassy, Canberra, Australia: +61 (0)2 6290 0755. Moroccan Embassy, London, United Kingdom: +44 (0)20 7581 5001. Moroccan Embassy, Ottawa, Canada: +1 613 236 7391. Moroccan Embassy, Washington DC, United States: +1 202 462 7979. Moroccan Embassy, Pretoria, South Africa: +27 (0)12 343 0230. Moroccan Embassy, Dublin, Ireland: +353 (0)1 660 9449. When planning a trip, remember there are other cities and towns other than Marrakech, Casablanca, and Fez! The following is a list of populations of cities in Morocco. The towns or cities marked as links will take you to The View from Fez stories on those places - Have fun - Explore! Enjoy! Nice Post, here is our link to our morocco tours : http://www.toursofpeace.com if you wish to visit the desert sahara or any place of morocco using our excellent services. Great post, full of lot´s of pertinent info for the traveler to Morocco. Thanks View from Fez! I know our visiting artists will find this info helpful. Thanks! I have a plan to go morocco this year or next year. I am enjoying Sussana's book, A House in Fez, fantastic read. I visited Fez in 1997 so reading this brought many colourful memories back to me. I also renovated a house back home in Brisbane and had many a chuckle at your awesome account of the building trades in Fez. Found the view from Fez as S mentions it in the book. Janette in Brisbane. Your blog is really informative. It will be helpful for people who are planning their holiday in Morocco. Thanks for sharing basic information someone need to know before a trip to Morocco.